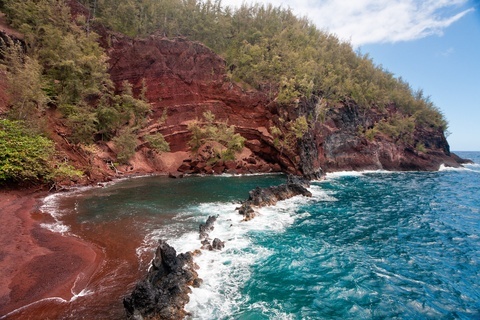 The Red Sand Beach, or Kaihalulu is also known as a "secret beach", and was at the TOP of my must-see list for my Maui vacation! If this picture leaves you as enthralled with this beach as I am, read on to find out more about this "secret beach," including detailed directions on how to get there! 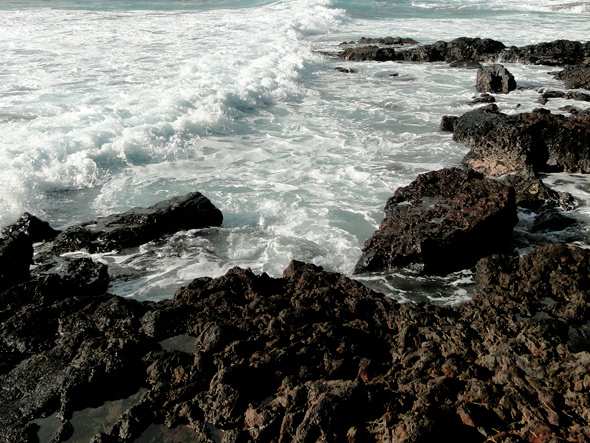 The beach is part of a crumbling red cinder cone, and there is a lava rock wall which breaks the force of the ocean waves before they can crash on the sand. 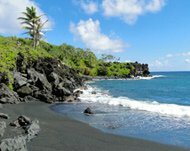 Because of this, people say that you can swim and snorkel in this small bay IF the water is calm, AND you don't venture past the protective lava rock wall. How do you feel about seeing perfect strangers in the buff? 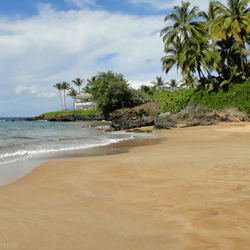 Due to the secluded nature of this little piece of paradise, Kaihalulu is known unofficially as a clothing-optional beach. 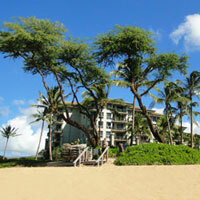 The Red Sand Beach (Kaihalulu) is also known as a "secret beach." As in "it's a secret how to get there." Happily for you and me, it is NOT a secret any longer! 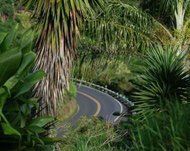 Drive the Hana Highway until you get to Hana. 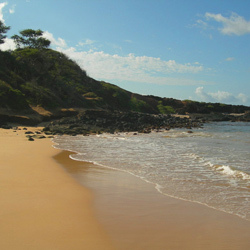 The Red Sand Beach (Kaihalulu, Maui) is located south of Hana Bay. On your left (east), you will pass Alau Street, Keanini Drive and Keawa Place. 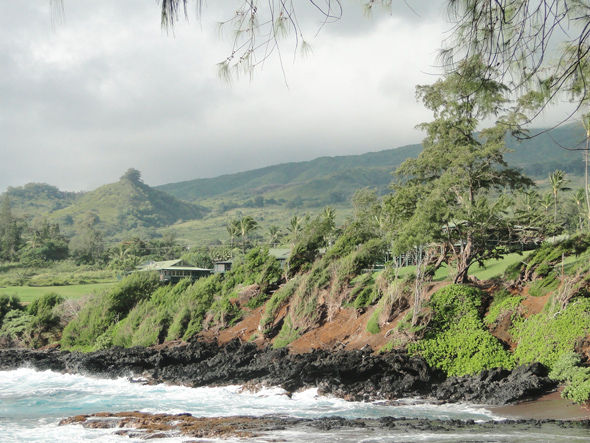 When you get to Hauoli Road, turn left (east) and follow it to the end where it intersects with Uakea Road. 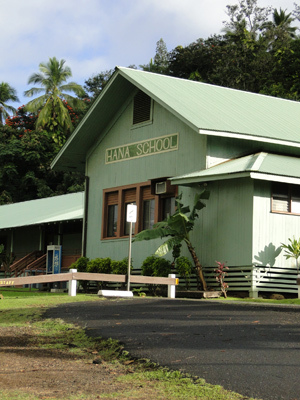 At this intersection, you'll see the Hana Ball Park on your left, the Hana School (pictured left) and Hana Community Center straight ahead, and the gates to the Travaasa Hotel Hana's sea ranch cottages at the end of Uakea Road on your right. 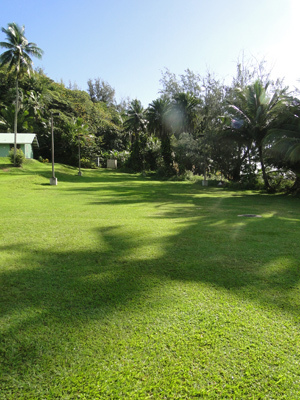 At the time we were here, there was street parking available in the dead-end section of Uakea Road leading up to the Travaasa Hana property. 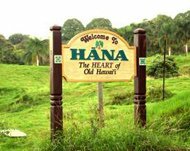 As I understand it, this next part involves heading onto the Hana Community Center and the Travaasa Hana's property, so to avoid trespassing, please ask for permission to look around before you go! If you start walking through the field, toward the end of it you'll see a lamp post on your right - there is a narrow dirt trail here that you follow down to an old ironwood tree. 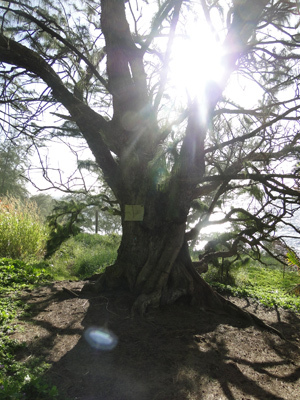 Even if you have no idea what an ironwood tree looks like, you can't miss this one! It's a huge tree in a little clearing with bare dirt and exposed roots all around it. At the time we were here, there was a home-made sign on the tree cautioning people NOT to take the trail to the left (which I believe goes to a Japanese cemetary), as that was the most dangerous route. As the sign advised, we headed along the trail on the right side of the ironwood tree instead. 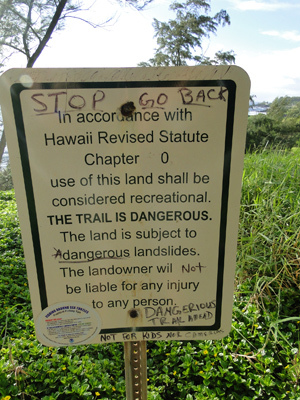 A short distance along this trail, you'll see an official sign advising you that the trail to Kaihalulu here is dangerous - believe me, they aren't kidding! The trail up to this sign is super easy, but a short distance later (see photo to the right) it gets rather scary, particularly if you're like me and not a fan of heights. My husband and I found ourselves on a super narrow trail with not enough traction due to these little round things underfoot, and a rather large drop onto a rocky shoreline below. And as if that wasn't enough of a challenge, the trail started to rise up, up and and away to a high peak. I'm not gonna lie, I started to feel sick with fear - our 2 little boys were waiting for us back at the condo with my mother-in-law, and if we slipped and had a bad fall down that steep slope, landing on the rocks, it would ruin everyone's vacation. 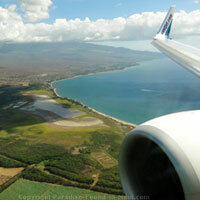 If it had been just my hubby and I on vacation, maybe I would have been game to continue on to Kaihalulu... but with 2 little ones who needed us in 1 piece, we just couldn't risk it. So with a lot of disappointment, we turned back. Now I know you might be wondering now if I might have messed up and gotten onto the wrong trail somehow. I wondered the same thing. He Looks Like He's On a Sunday Stroll! Then we saw a grey-haired older gentleman who looked like a local go by - he was wearing nothing but a bathing suit and hiking shoes, with a beach towel slung casually over his shoulder - to my amazement, he was briskly walking along this trail as if he was on a Sunday stroll in the park! Then another couple came along the trail - they said they come here all the time and confirmed that this was indeed the right trail to the Red Sand Beach. Sigh. I had kind of been hoping that we WERE on the wrong trail, since that would mean there was still hope for me to see Kaihalulu for myself! Please don't bring your children here - you'd never forgive yourself if they had a bad fall and were injured, or worse! If you go, wear sturdy hiking shoes with good traction - even with a dry trail, it was very slippery with all those little round things scattered about. Last, but not least, it's not recommended that you go on this trail if it's wet - the moisture will make it even MORE treacherous than usual. 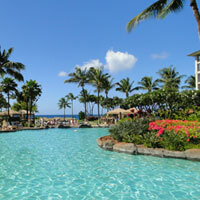 Do you see the Red Sand Beach on the map? Just follow Uakea Road in a southerly direction... you'll see the road turns to the east and then comes to an end - a short distance from the end of it, you'll see the beach (on the right side of the map)... you can even see the lava rock wall breaking the waves! Press the "+" button on the left side of the map to zoom in for a closer view of the Red Sand Beach!